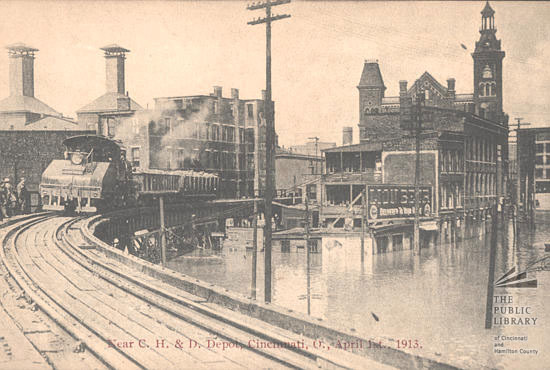 The Cincinnati, Hamilton and Dayton Railroad (CH&D) was a railroad based in the U.S. state of Ohio that existed between its incorporation on March 2, 1846, and its acquisition by the Baltimore and Ohio Railroad in December 1917. (This railroad should not be confused with the Cincinnati, Hamilton & Dayton Railway, an Ohio interurban of exactly the same name which existed between 1926 and 1930.) 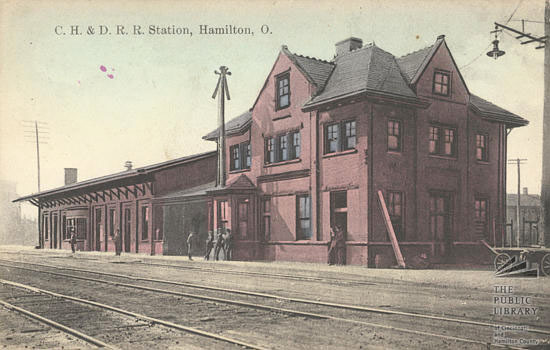 It was originally chartered to build from Cincinnati to Hamilton, Ohio, and then to Dayton, a distance of 59 mi (95 km); further construction and acquisition extended the railroad, and by 1902 it owned or controlled 640 mi (1,030 km) of railroad. Map of the C H and D RR in 1873, D and M RR is in red; C H and D in yellow. The original CH&D was founded by John Alexander Collins, who was born on June 8, 1815 in Staffordshire, England. He came to the US as a child in 1825, and worked as a locomotive engineer until moving to Ohio in 1851 to open the CH&D. Collins remained with the line until 1872, six years before his death in Covington, Kentucky. Collins is buried in Woodland Cemetery in Dayton, where his tombstone details his life and its work. On May 1, 1863, the CH&D leased the Dayton and Michigan Railroad in perpetuity. 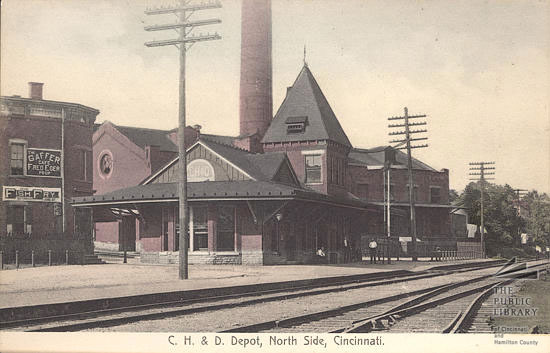 In 1891, it acquired the Cincinnati, Dayton and Chicago Railroad, while in March of that year it added the Cincinnati, Dayton and Ironton Railroad. In 1886 the CH&D was among the railroads controlled by the financial speculator Henry S. Ives before his spectacular collapse the following year. The Detroit and Michigan was the second railroad to reach Lima, Ohio, reaching there in 1858. By 1880, they had established a significant shop facility on the north side of town with over two hundred employees. 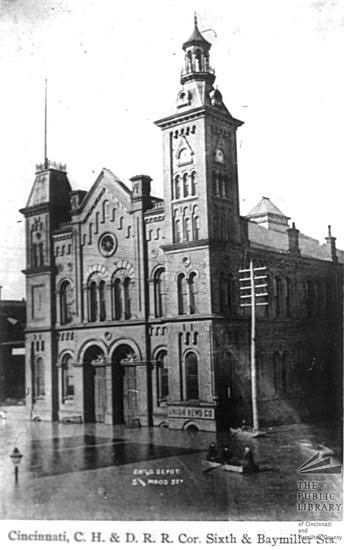 The Detroit and Michigan had a freight depot west of the tracks and south of East North Street, between North Central Avenue (once Tanner Street) and North Jackson Street. Successor CH&D built a larger structure on the site, which continued to be used by the Baltimore and Ohio at least into the 1950s. The passenger depot followed a similar pattern, but was located farther north, between East Wayne Street and the Pennsylvania Railroad tracks. ^ R.H. Harrison (1880). Atlas of Allen County, Ohio. R.H. Harrison. ^ Insurance Maps of Lima Ohio (Sanborn Maps). Ohio Web Library: Sanborn Map Company. 1950 . p. 29. ^ Lima, Ohio (Sanborn Maps). Ohio Web Library: Sanborn Map and Publishing. 1887. p. 4. ^ Lima, Ohio (Sanborn Maps). Ohio Web Library: Sanborn Map and Publishing. 1911. p. 29. Morris, J.C. (ed). 1902. 1902 Ohio Railway Report. CCH&DRR Family Tree. Retrieved on May 16, 2005.